Schmuhl Schmuhl was the father of David, below. At the time (1700’s) most Jews did not use family names. The descendants of this David Luft are not listed due to permission issues. The family immigrated to New York in 1886. Please contact me directly for more information on them. - Abraham LUFT (May 1848, Berlin - 13 November 1931, Bronx, NY) & Henriette ABRAHAM (1852, Berlin - ) Abraham Luft and his family came to New York in 1886. • Gretchen (Kate) LUFT* (17 March 1878, Berlin - 13 March 1945, Brooklyn, NY) & Edward NEWBY ( - 2 October 1960) See photo, left. • William LUFT (August 1880, Berlin - 8 July 1945) & Mollie BOSS (October 1883 - 11 February 1926) Mollie died young. Since William was unable to raise their six children on his own, they were placed in the Hebrew Orphan Asylum in New York City, where they grew up. ‣ Anna LUFT (1921, New York, NY - 1930, New York, NY) Anna died at age nine of gangrene. Hanne and Beile (below) being the daughters of Machol Luft is somewhat speculative. The marriage records of Flatow show Hanne being the daughter of Michael Luft. This could just be a variation in the spelling of Machol, or an error either in the writing of the name or in my reading of it. For Beile it is a little more speculative, requiring a bit of deduction. The records simply show Beile or Berta Luft being married to David Luft. There are records of three Lufts in Flatow belonging to her father’s generation, Leibusch, Machol, and Samuel. Leibusch is the father of Beile’s husband David, so he can’t be her father too. Samuel had another daughter named Beile (who married Marcus Klein, see below). Therefore her father is probably the remaining Luft, Machol. Beile or Berta Luft married David Luft, near the top of this page. Max Tau was a writer, editor, and publisher living in Norway. He won the 1950 Peace Prize of the German Book Trade. • Selma LUFT (2 February 1892 - April 1982, New York, NY) & William BAB (1889 - ) The family came to America in 1938. - Max LUFT (20 December 1866, Plietitz - ) & Martha PLACZECK (8 January 1867, Nakel/Naklo - ) Martha had been married to Max’s brother, Samuel, above. The family went to England in 1939. Growing up in Los Angeles I knew Herbert and Pepi Luft; they visited our home often. 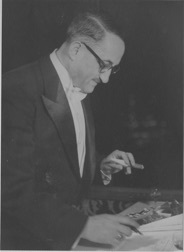 Herbert worked in the movie business, mainly as a film critic. - Caeser (Cäsar) LUFT (4 March 1874, Krojanke - 23 July 1939, Berlin) & Gertrud ARNDT (11 January 1886 - 3 March 1975) Cäser Luft is buried in the Berlin Weissensee Cemetery. See photo at left. • Dr. Walter David LUFT (15 November 1907, Berlin - January 2008) & Annemarie SCHNEIDER (3 February 1919, Berlin - 20 August 2009, Milford, NY) Walter came to the U.S. in 1939, Annemarie in 1936. They were married in Buffalo, NY in 1940. • Gerhard LUFT* (30 November 1908, Berlin - about 2000, Austria) & Margot Paula LITTMANN (23 December 1912, Berlin - about 1944, Auschwitz) Gerhard survived the Theresienstadt and Auschwitz concentration camps. Margot did not. Some of the following names use the Spanish convention of having the father’s last name followed by the mother’s last name. Jakob Luft was a merchant and a Cantor. See photos above and at the bottom of the page. • Gerda Henriette LUFT (9 February 1924, Berlin - 14 November 1948, Berlin) & Walter CORDES (11 July 1920, Hamm - 26 April 1998, Berlin) After the death of Gerda, Walter Cordes later married Netty Luft, above. Alfred Luft, my grandfather, is shown at left. He owned a textile company in Berlin. One day the Gestapo came to the business looking for him. He grabbed his passport, went out the back door, headed for Sweden, and never went back. Why the Gestapo was looking for him is a bit murky. I’ve heard that it was due to his friendship with a French spy, or maybe it was because his girlfriend was an “Aryan.” In any case, he settled in Stockholm, where he lived until his death in 1975. ‣ Eva Nanni LUFT (1921 - ) & Gunnar Arthur GLUCKMAN (1922 - ) Eva lived underground in France during WWII. Imprisoned in the Gurs concentration camp in southern France, she escaped just before deportations to Auschwitz and other death camps began. She was hidden for a time by nuns in a convent. For a time she was able to hide by working as a nanny for a French family. She also worked in a restaurant in Nice frequented by German soldiers. After the war she joined her father and siblings in Stockholm; in 1952 she moved to Los Angeles. See photos of her at the bottom of the page. - Clas GLUCKMAN (1951 - ) & Linda SMOOT Newlyweds!!! 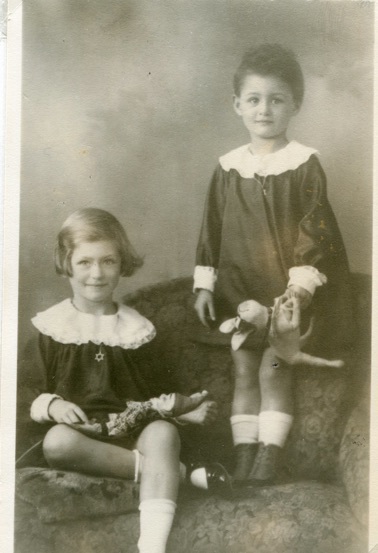 ‣ Susanne (Susi) Jeanette LUFT (1924 - ) & Paul Louis KLEINSTRASS later KESTER (1925 - ) Susanne was sent to a boarding school in southern Sweden starting in 1935. There she met Paul when he came to the same school in 1939. She moved to Stockholm where her father was living in 1941. 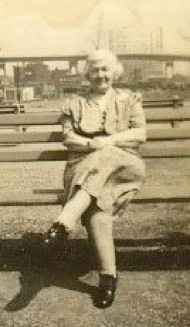 In 1948 she immigrated to the U.S., as did Paul. They were married in 1949. See photos of Susanne at the bottom of the page. Werner Luft was an artist and a scientist. 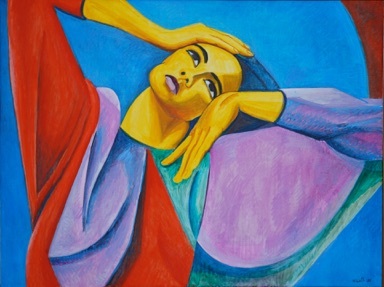 He studied art as a teenager, including in post-war Paris. There he saw many starving artists, so decided he needed a back-up plan. He studied engineering in Stockholm, then immigrated to the U.S. He was one of the early researchers into photovoltaic solar cells, publishing a couple of books on the subject, and was instrumental in developing their use for space applications. He continued painting throughout his life; one of his paintings is shown above. Joseph TAWRIGOWSKI genannt FRIEDLÄNDER was the grandson of Rabbi Nathan Friedland (1808-1873). Together with Rabbi Zvi Hirsch Kalischer, Friedland was one of the original “proto-Zionists,” Zionists fifty years before Theodor Herzl (the “Father of Zionism”). These early Zionists, mostly Rabbis, based their Zionism on religious arguments, rather than on the secular political arguments of Herzl. Much of the information on this page was collected by Klaus. Veronika Schmidt is an author writing under the name Vera FRIEDLÄNDER. Her books include, Man kann nicht eine halbe Jüdin sein (One cannot be a half-Jew) and Späte Notizen. She was a Professor of German Language at the Humboldt University in Berlin. She is a winner of the Jacob and Wilhelm Grimm Prize for her writing. Martin immigrated to New York. Selma Makowski together with her husband Herbert and two year old daughter Monique were hiding underground in Nice, France, as was my aunt, Eva Luft (see Eva’s photos below) who they were in close contact with. 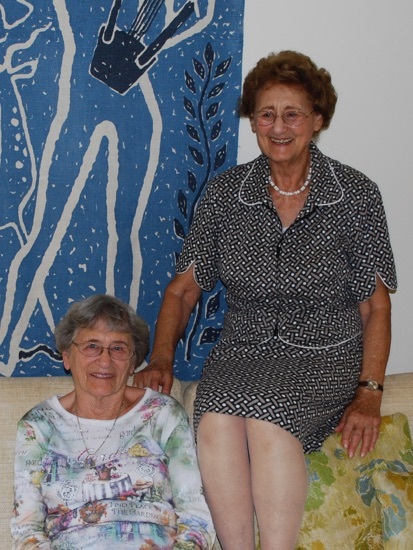 The Gestapo arrested Selma and Monique and they were sent to Auschwitz where they were both murdered. Herbert was not at home when the Gestapo came, so was able to escape and survive. Else was Jacob’s second wife. In the Jewish Museum in Berlin, there is a whole display case about her and her daughter Kate. It includes letters sent between Kate in Shanghai and Else in Berlin and later Theresienstadt. See photo below. Kate and Walter Fränkel escaped Germany for Shanghai. Shanghai was considered the place of last resort, for Jews in Germany who were unable to get visas for anywhere else. Living conditions were terrible. As Kate told me in later years, “When people hear that I lived in Shanghai, they say, ‘Oh that must have been interesting.’ It was NOT interesting!” They owned a small radio repair shop in Shanghai. After the war they came to San Francisco. Walter died in 1958. Kate lived in San Francisco until the late 1970’s, when her health got poor and she moved to a home in San Jose. 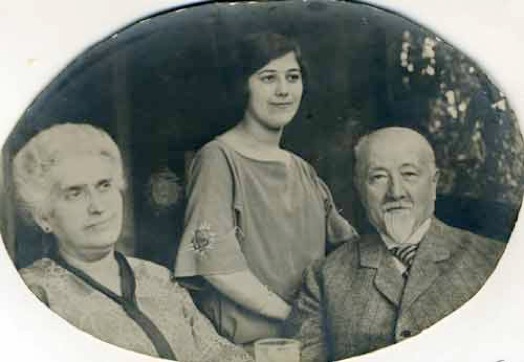 A picture of her with her parents is shown below. **People with two asterisks after their name were married to a relative who can also be found somewhere on these pages. Luft is my mother’s family’s name. The earliest records of this Luft family are from the town of Krojanke, now Krajenke, a small town in what is now northwest Poland, but was previously part of West Prussia (see MAP). Family members also lived in Flatow (now Zlotow), a larger town about 5 km (3 miles) from Krojanke. The brothers Leibusch, Samuel, and Machol all took the name Luft when Jews in that area took family names, around 1812. The brother Samuel (1795 - 1869) had several children. 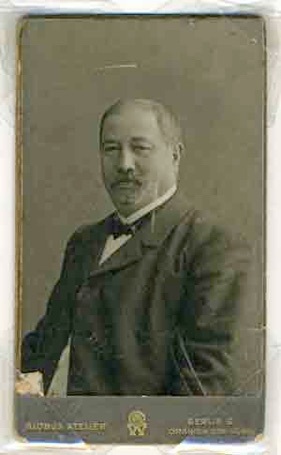 His son David (1836 - 1881) had several descendants who were killed during the Holocaust. Other of his descendants emigrated to the United States. 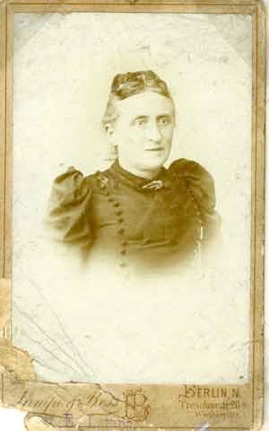 Samuel’s daughter Beile (or Berta) (1840 - 1908) had many descendants who went to Chile. Many also ended up in Israel. A third child of Samuel was Jacob Luft (1847-1929), shown at right, my great-great-grandfather. Jacob Luft was born in Berlin and was both a merchant and a cantor. He was married twice, and had nine children. He lived with his family for several years in Eisleben, where he served as the Cantor in the Synagogue. His first wife was Jeanette Morgenstern. She is buried at Berlin Weissensee Cemetery. The records there say she was born in Kyritz, but that seems to be incorrect, as the Kyritz records don’t list her, or even anyone else with the name Morgenstern. 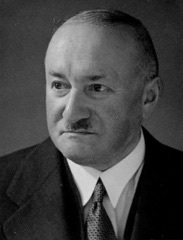 Jacob’s second wife, Else Meyer, died in the concentration camp Theresienstadt. There is a display case in the Berlin Jewish Museum about her and her story. See Jeanette’s and Else’s pictures at the bottom of this page. Names in RED in the listings below are people who were murdered during the period 1933-1945. Special thanks to my cousin, Klaus Falldorf in Bremen, who researched and assembled much of this data. Thank you also to Edward David Luft, who has done very much research on the Luft family. Thanks also to Tom Newby for information on the descendants of Gretchen Luft.